Acid rain is made up of water droplets that are unusually acidic because of atmospheric pollution, most notably the excessive amounts of sulfur and nitrogen released by cars and industrial processes. Acid rain is also called acid deposition because this term includes other forms of acidic precipitation, such as snow. Acidic deposition occurs in two ways: wet and dry. Wet deposition is any form of precipitation that removes acids from the atmosphere and deposits them on Earth’s surface. Dry deposition polluting particles and gases stick to the ground via dust and smoke in the absence of precipitation. Even though dry, this form of deposition is dangerous as well, because precipitation can eventually wash pollutants into streams, lakes, and rivers. Acidity itself is determined based on the pH level (the amount of acidity or alkalinity) of the water droplets. The pH scale ranges from 0 to 14, with a lower pH being more acidic, while a high pH is alkaline; seven is neutral. Normal rainwater is slightly acidic, with a pH range of 5.3-6.0. Acid deposition is anything below that range. It is also important to note that the pH scale is logarithmic, and each whole number on the scale represents a 10-fold change. Today, acid deposition is present in the northeastern United States, southeastern Canada, and much of Europe, including portions of Sweden, Norway, and Germany. In addition, parts of South Asia, particularly China, Sri Lanka, and southern India, and South Africa are all in danger of being affected by acid deposition in the future. Acid deposition can be caused by natural sources such as volcanoes, but it is mainly caused by the release of sulfur dioxide and nitrogen oxide during fossil fuel combustion. When these gases are discharged into the atmosphere, they react with the water, oxygen, and other gases already present there to form sulfuric acid, ammonium nitrate, and nitric acid. These acids then disperse over large areas because of wind patterns and fall back to the ground as acid rain or other forms of precipitation. The gases most responsible for acid deposition are a byproduct of electric power generation and the burning of coal. As such, man-made acid deposition began becoming a significant issue during the Industrial Revolution and was first discovered by a Scottish chemist, Robert Angus Smith, in 1852. In that year, he discovered the relationship between acid rain and atmospheric pollution in Manchester, England. Although it was discovered in the 1800s, acid deposition did not gain significant public attention until the 1960s, and the term acid rain was coined in 1972. Public attention further increased in the 1970s when the New York Times published reports about problems occurring in the Hubbard Brook Experimental Forest in New Hampshire. After studying the Hubbard Brook Forest and other areas, researchers found several important effects of acid deposition on both natural and man-made environments. Aquatic settings are the most clearly affected by acid deposition, though, because acidic precipitation falls directly into them. Both dry and wet deposition also runs off from forests, fields, and roads and flows into lakes, rivers, and streams. As this acidic liquid flows into larger bodies of water, it is diluted, but over time, acids can accrue and lower the overall pH of the body of water. Acid deposition also causes clay soils to release aluminum and magnesium, further lowering the pH in some areas. If the pH of a lake drops below 4.8, its plants and animals risk death. It is estimated that around 50,000 lakes in the United States and Canada have a pH below normal (about 5.3 for water). Several hundred of these have a pH too low to support any aquatic life. Aside from aquatic bodies, acid deposition can significantly affect forests. As acid rain falls on trees, it can make them lose their leaves, damage their bark, and stunt their growth. By damaging these parts of the tree, it makes them vulnerable to disease, extreme weather, and insects. Acid falling on a forest’s soil is also harmful because it disrupts soil nutrients, kills microorganisms in the soil, and can sometimes cause a calcium deficiency. Trees at high altitudes are also susceptible to problems induced by acidic cloud cover as the moisture in the clouds blankets them. 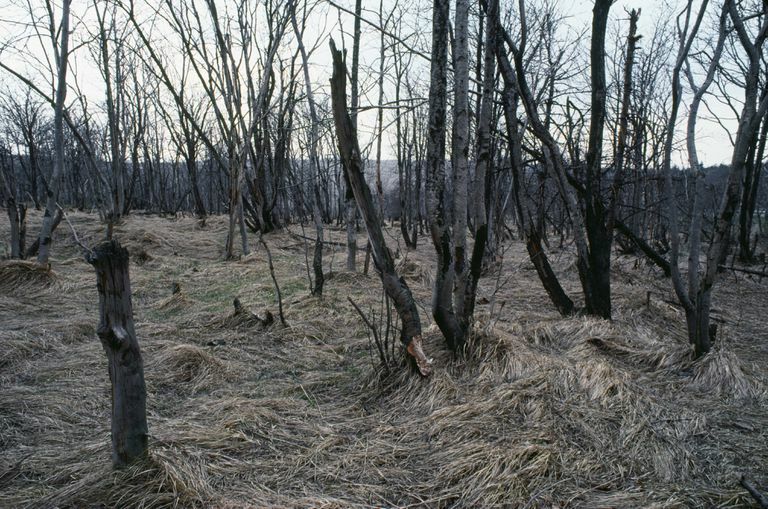 Damage to forests by acid rain is seen all over the world, but the most advanced cases are in Eastern Europe. It’s estimated that in Germany and Poland, half of the forests are damaged, while 30 percent in Switzerland have been affected. Finally, acid deposition also has an effect on architecture and art because of its ability to corrode certain materials. As acid lands on buildings (especially those constructed with limestone), it reacts with minerals in the stones, sometimes causing them to disintegrate and wash away. Acid deposition can also cause concrete to deteriorate, and it can corrode modern buildings, cars, railroad tracks, airplanes, steel bridges, and pipes above and below ground. Because of these problems and the adverse effects of air pollution has on human health, a number of steps are being taken to reduce sulfur and nitrogen emissions. Most notably, many governments are now requiring energy producers to clean smokestacks with scrubbers that trap pollutants before they are released into the atmosphere and to reduce car emissions with catalytic converters. Additionally, alternative energy sources are gaining more prominence today, and funding is being put toward the restoration of ecosystems damaged by acid rain worldwide. 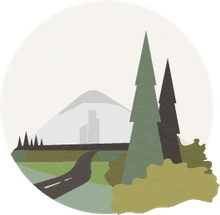 Follow this link for maps and animated maps of acid rain concentration and other pollutants in the United States. Can Acid Rain Kill You?